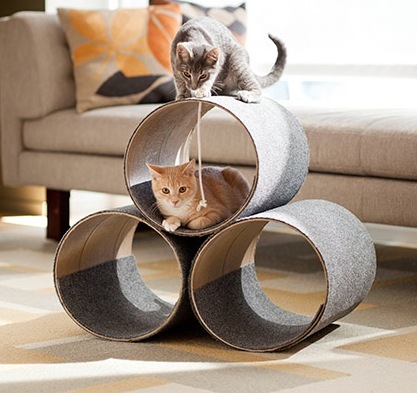 The minute we saw this simple but amazing do-it-yourself kitty play house on our beloved blog Moderncat, we knew what we’d be doing this weekend! For less than $40, this project from Lowe’s comes with a supply list, tool list, and super easy-to-follow step-by-step instructions with big beautiful photos – there’s even a how-to demo video! It starts with a cardboard concrete form and a carpet runner. A little adhesive (look for one that says non-toxic when dry) and voila! It makes this super sleek looking 3-section carpet-covered kitty condo playhouse. Visit the Lowe’s Creative Ideas website for all the instructions and to check out the video to see how it’s done.